Fall is just around the corner, and in many parts of the country, this is a very popular time of the year for weddings. It is also a time of year when it starts to get a little chilly, especially if your wedding celebration runs into the early evening hours. If you are searching for a way to add a warm glow to your fall wedding, why not consider adding some of our heart sparklers to the event. Here come the bride and groom leaving the church as husband and wife for the first time. This is the perfect time to bathe them in the glow of beautiful heart sparklers. Everyone in the wedding party can form a gauntlet of wedding sparklers that the bride and groom can pass through to make it to the wedding reception. This takes a little extra planning, as the heart-shaped sparklers will only remain burning for 50 seconds. The best way to handle this and keep the "tunnel of love" going, is to have everyone in the gauntlet light their heart sparklers in sections with the last person in the first section using their sparkler to light the first one in the next section, and then everyone else passing the flame. This staggered approach ensures that the happy couple has time to stop and thank everyone for coming and still be able to exit via a tunnel of golden sparks. Most professional wedding photographers are used to unusual requests from the happy couple. It might be unusual positions (like on horseback or doing a dance lift! ), comedy shots, romantic shots with the sunset in the background, or, if the couple has been shopping at the Wedding Sparklers Outlet, it could be the use of wedding sparklers in some of the shots. One of the great things about our entire selection of sparklers is that they burn virtually smoke free, making them the right choice for use in your wedding photos. Each of the red or silver heart sparklers measures 11 inches long and will burn for approximately 50 seconds, just enough time for the happy couple to get settled into position for the photograph. 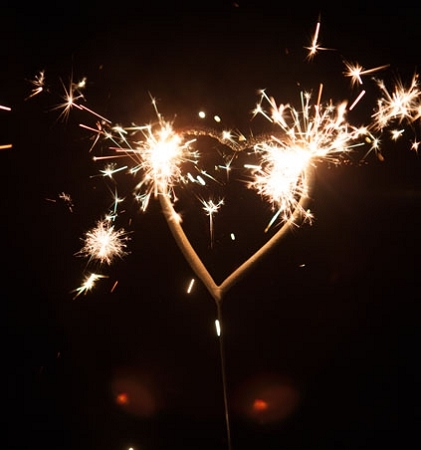 There can be photos of the couple holding heart sparklers in front of each other, with wedding party members showering the bride and groom from above, even the entire wedding party all holding a burning sparkler for the big group photograph. Imagine how dramatic your night shots might be if they were illuminated by several heart-shaped sparklers being held aloft around the happy couple. Give your guests a selection of wedding sparklers they can use to have fun with and help light up the pictures you will keep for the rest of your life. Once the sparklers burn out, all you need for cleanup is one or two of our wedding sparkler buckets filled with water. Once everything has cooled down, you can toss the remains in the trash, or better yet, run them over to your local metal recycler. Be sure you are buying the best quality sparklers by shopping online at the Wedding Sparklers Outlet, remember to order early to avoid the risk of any delays!